NewTek Sensor Solutions has introduced the MBB Series of Ultra-Precision Dimensional Gauging Probes engineered for highly accurate and repeatable measurement of dimensional parameters in a variety of quality control, industrial metrology and inspection equipment applications. Offering great precision and infinite resolution, these spring-loaded AC-LVDTs are ideal for use in roundness measurements, automotive testing, metal component gauging and materials testing. 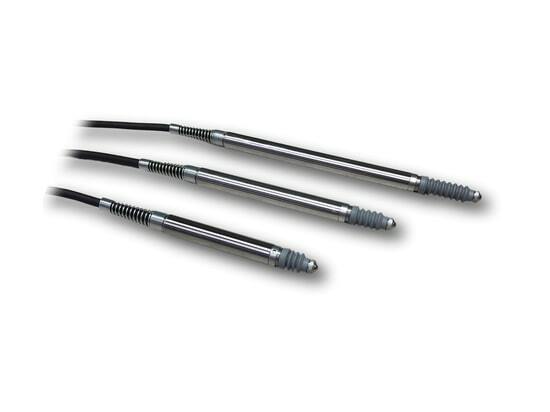 They feature a stainless steel probe assembly and 8mm diameter housing protected to IP-65. High-precision linear ball bearings provide for smooth probe movement without stiction and excellent repeatability. Incorporating a linear ball bearing assembly fitted to a non-rotating probe shaft, they produce an output voltage linearly proportional to the probe’s shaft position with minimal radial play. The use of an AC-operated LVDT for shaft displacement reduces errors due to friction, resulting in a highly precise measurement of the position of a target surface. More precise substitutes to mechanical position indicators and digital dial gauges, the MBB Series are reliable with greater than 100 million cycles with linearity of less than 0.05% of full range. They are available in three standard ranges: ±.040 inch (±1.0 mm), ±0.100 inch (±2.5 mm) and ±0.200 inch (±5.0mm).